Never standing still – looking beyond limits and borders – always learning, always experimenting: these should be defining characteristics of every artist. 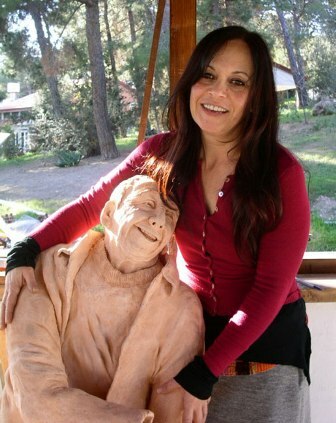 So it is with Sevcan Cerkez, the creative mother of many life sized modelled sculptures, three-dimensional portraits of Cypriot villagers, and cartoon sculptures as she calls them herself. Sevcan was born in 1961 in Küçük Kaymaklı near Nicosia, where she and her twin sister decided together what they would be when they grew up. Sevcan has been exhibiting her clay family in many exhibitions south and north of the island and has received much praise for her work, participating in and winning competitions. Her last sculptures were of life sized angels with wings on their backs. One project, organised by People to People International, asked for a composition on We Women, and she wrote about the situation of Cypriot Turkish women. She has now been invited to travel with a partner to two different countries to meet women artists in their studios, and discuss and learn new perspectives. Her countries of choice were Finland, Italy or the Netherlands. Her travel partner will be her close friend Sinem Ertaner, another young promising ceramic artist in Nicosia.Her first journey will take her to Italy in October for 10 days, the second to the Netherlands in May 2010. "Turkish Cypriot women living on this small island feel that they are stuck on this land both physically and spiritually. According to research of recent years, Turkish Cypriot women who had always found it difficult to express their desires in the past have now begun to state their wishes more easily. They have started to question and analyse amongst themselves what they want to do and what they can't. The quality of life here has been blighted by the continuing war, the politics of self-interest that prevails in Cyprus, and the consequent economic problems caused by those politics. As a result, the individuals of this country are victims of all the cultural and economic obstacles arising from the embargoes and political mistakes on this island. A community which is cut off from the rest of the world also suffers from a lack of technological development, as they lose out in the global competition to export their limited production. The alternative has been a vast number of people gravitating to working for the government, giving rise to a community who cannot produce on their own, who cannot be creative. A community whose creative skill has been stifled, and who has been encouraged to work in the government feels left out, cut off from the rest of the world. That brings psychological problems both on the community as a whole and to its individuals. But in all this chaos, what is the situation of Turkish Cypriot women? Many Turkish Cypriot women constantly question themselves and their situation and ask whether the world is fair in allocating the opportunities available to women. They contrast the rights that have been accorded them with the rights accorded to other women in the rest of the world. Even though Turkish Cypriots are Muslims culturally, they have never perceived religion per se as their guiding force. However, Islam is a patriarchal religion, and that patriarchal aspect is a dominating factor in women's lives as it is in other places of the world. Many women cannot improve their creative skills because of this mentality. They cannot find a way to surmount this obstacle. The second project is a residency in Cape Town organised by the Commonwealth Foundatıon. Sevcan's work was selected by the Foundation as 6th out of 430. The residency will last for three months starting in January 2010 where she will work at the University together with artists. During this period she will (a) create and share her own work with others, and (b) she will be taught two subjects she has chosen, that is the bronze casting sculpture process and sculpting with wax. At the end of the three months stay an exhibition will be organised for her. For her it will be the very first time she has been away from the country by herself for such a long period. But she will not be alone. There is a Turkish Cypriot artist living in Cape Town, a friend of ours, and also an international crowd of artists, and among artists, you are never alone because you all are in the business of creating things, and that is a common language in itself. 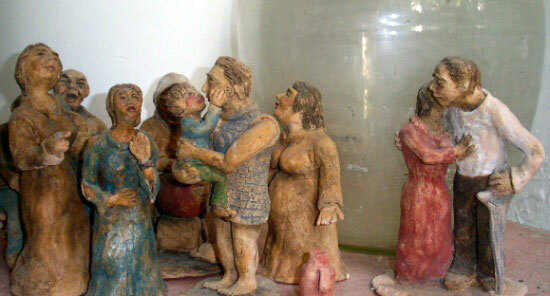 Before she starts on these adventures, Sevcan will be holding an exhibition in Istanbul beginning of October 2009, to which she will take her clay family by ship. The exhibition will be at the Dolmabahce Gallery in the gardens of Dolmabahce Palace. What an undertaking! When she has completed these wonderful projects, she says, she will teach others the bronze casting sculpture process and wax sculpting. We wish her not only luck but success and the wider horizons that only travel and new friends can bring. According to research, the sector of Turkish Cypriot women with the highest sense of awareness is formed by those who are artists. Many of them believe that the best way they can integrate with the rest of the world is through art. But they have yet to surmount the obstacles that confront them, and being unable to share what they have created with the rest of the world, they come to feel almost invisible. Being in touch with other European artists, however, they would have the opportunity to see their conditions from the outside, as it were, and where they are placed in the world. If we assume that art is universal, Turkish Cypriot women must be given the opportunity to get in touch with European artists to improve their art. I believe that there should be opportunities for dialogues to develop between Turkish Cypriot women artists and Women's Associations in Europe, and that those dialogues should be documented and transferred to the Women's Associations and women in Cyprus."